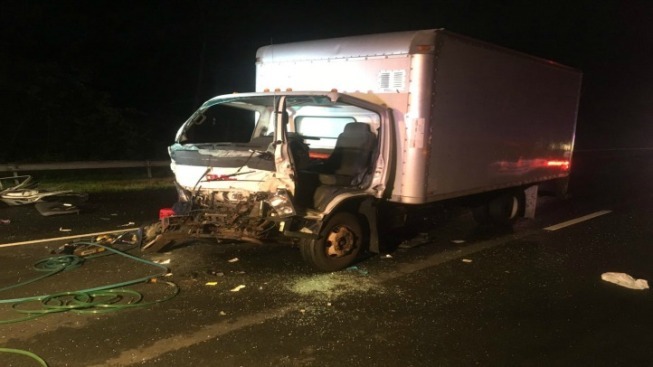 The driver of a box truck was trapped in the vehicle after a crash on Interstate 84 East in Tolland and sustained serious injuries, according to police. The box truck and a tractor-trailer collided just after 4 a.m., between exits 67 and 68, and two lanes of I-84 East were closed until just before 6 a.m. The driver of the box truck was trapped and first responders pulled the unidentified person from the vehicle. An ambulance responded and transported the driver to the hospital. All lanes of the highway reopened just before 6 a.m. and the crash is under investigation.